Until 1957, British television closed down for an hour from 6pm, to give parents a chance to put their children to bed. Independent television, which made its money from selling advertising space, disliked losing an hour's revenue, so ITV decided to plug the gap, and the State-owned BBC had to follow suit. The BBC decided to introduce a show for young people on Saturdays, and as it was to start at 6.05, it was named the 6.5 Special. To run it, they appointed two of their youngest producers, 27-year-olds Josephine (Jo) Douglas and an Oxford University graduate, Londoner Jack Good. Jack was to become the undisputed champion on rock 'n' roll on British TV. As Jack indicates, the original shows were not dedicated solely to rock 'n' roll - or even to music. There were sports features and even, once, an entire sequence on the British aircraft industry. Good was determined to frustrate the BBC bosses' wishes to emphasise the magazine format. He wanted music and lots of movement. To get his way, Good had sets built, but shortly before the show started, they were wheeled out of the way, and he filled the space with the milling audience and performers. 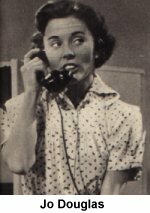 Good's production illustrated a characteristic that became a hallmark of all of his TV shows. Although the audience provided an ever-changing dynamic setting, the movements of the performers were tightly controlled. He would give a singer specific guidance about camera positions, instructing them to gear the scale of their movements to proximity of the camera. "If the camera is on long shot, let's have plenty of action. When it's on your face, a sneer will get a scream," he told one American performer. The show launched the hand jive and Good even wrote an instruction book, Hand Jive At 6.5. The BBC were terrified of Good's ability to think on his feet and to follow his instincts, so eight months after the show started, they appointed the reliable Dennis Main Wilson (later to become well-known as the producer of Top Of The Pops) as co-producer. His main previous experience had been producing the Goon Show on radio. None of the 6.5 Special productions shows was taped, so they are lost for ever, but a low-budget film based on the show survives. Although Jack had given the BBC a show that was attracting 12 million viewers, he was being paid only £18 a week . He left for independent television and launched Oh Boy! in June, 1958. 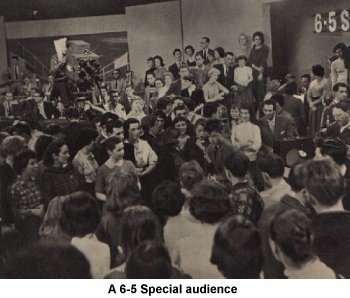 After trial broadcasts in the Midlands, it went national, in direct competition with 6.5 Special on Saturday evenings. 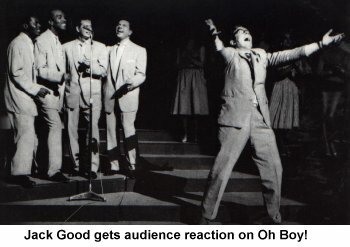 6.5 Special stuck to its mix of rock, jazz, skiffle and crooners, but Good was in his rock 'n' roll element with Oh Boy! The programmes were broadcast from the Hackney Empire, London and made a star of Cliff Richard, as well as showcasing Billy Fury on several editions. The show is also remembered for the brilliantly-named Lord Rockingham's XI - actually a 13-piece band put together by arranger Harry Robinson. He shut himself in a caravan at a seaside resort and analysed the appeal of a pile of American records, before settling on a line-up of two tenor saxes, two baritone saxes, a double bass, a piano, an organ (played by Cherry Wainer), Latin American percussion, three guitars and drums and whatever else might be needed. But when ITV replaced the show on 12 September 1959 with Boy Meets Girls, people wondered whether Jack had lost his touch.Jack later claimed his wife persuaded him that rock 'n' roll was on the way out and to adopt a more middle of the road approach. Marty Wilde was The Boy in question. The pace was pedestrian, with formal introductions of each act and flabby interviews - much like the middle-aged variety shows that Good's fans never wanted to see again. Sound file. 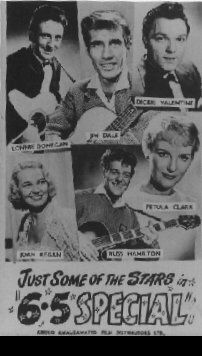 The show's great achievement, however, was to introduce the British public to some of the very best American performers, including Eddie Cochran, Gene Vincent and Freddy Cannon. Boy Meets Girls ended its run unmourned on 5 March 1960 and Good returned to the formula that had made his name with Wham! on 30 April. It used a compère, disc jockey Keith Fordyce, but the artists were hurried on to hustle each other out of the spotlight. Regulars were Billy Fury, Joe Brown, Jess Conrad and the Vernons Girls. Wham! finished its run on 18 June and in just over three years, the Jack Good television era was over. In 1964 he made a superb one-off programme, Around The Beatles, but an attempt to revive a machine-gun delivery rock show in 1980 with Let's Rock was a flop. 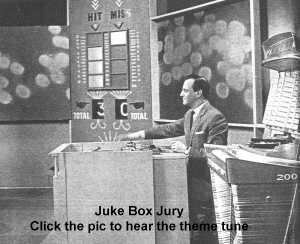 Regular rock 'n' roll television had disappeared from British screens, to be replaced by the middle-aged gunge of Juke Box Jury and Thank Your Lucky Stars. The brightest spot was Ready Steady Go, which made heavy use of Good's technique of building excitement and interest by allowing the audience to mill round the singers. Good championed the rise of rhythm and blues and went to the United States in 1962, where he spent $15,000 of his own money to produce a pilot show for the American market. After trying for a year to persuade television executives to take on the show, he gave up and returned to the UK. A year later, a disc jockey gave the tape of the pilot show to a TV boss, who sent for Good. 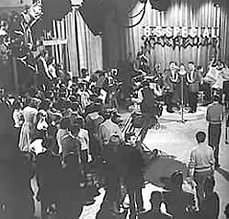 The first Shindig show, broadcast in the States on September 16, 1964, was, in fact, an episode of Ready Steady Go with changed titles. 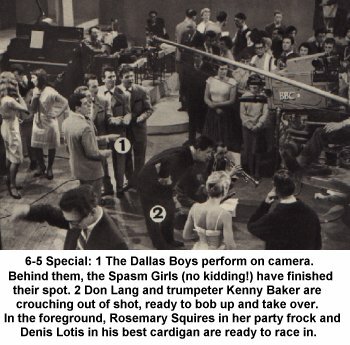 Shindig had a half hour spot until January 1965, when it was extended to an hour, before switching to twice-weekly half hour episodes in the autumn. Occasional broadcasts were from London. Jack fell out with ABC executives and walked out. The show could not survive without Jack's dynamic influence and it was cancelled in January 1966...to make room for Batman. Away from television, Jack was the producer of Billy's 10-inch debut LP, The Sound Of Fury and of records for several other singers, including Jess Conrad and Karl Denver. Jack went on to produce the musical Elvis, and in the West End, the autobiographical Good Rockin' Tonite. It was premièred at the Strand Theatre on January 28, 1992, before celebrity guests including Cliff Richard. Joe Brown booed the entrance of the character playing Larry Parnes. Jack moved to a desert village near Albuquerque, New Mexico, USA, where he indulged his love of painting by decorating the walls of the local church with murals. He returned to the UK in November 2001 and lives in a small village, spending his time painting. His major remaining ambition is to play King Lear! In April, 2003, he emerged from retirement at my request to unveil the �44,000 statue of Billy in Liverpool. ABOVE: Jack and his number 1 fan, April 2003. 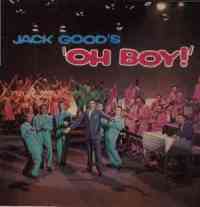 Jack Good was twice lead singer on a record, although his name did not appear on the labels. 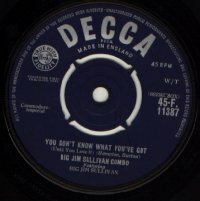 In 1961, Elvis Presley soundalike Ral Donner made a single called You Don't Know What You've Got, which was covered in this country by the "Big Jim Sullivan Combo". Terry Wilson, who runs the official Ral Donner website, wanted to trace a copy, so that he could put an audio file on the site. Terry, who lives in Canada, located one at a second-hand record dealer's in this country, and asked me to grab it. Meanwhile, he had e-mailed Big Jim, who in the 1960s, was one of this country's most prolific session guitarists. (He played on Billy's Halfway To Paradise.) A fascinating tale emerged. Jim wrote: "I was at Marty's (Marty Wilde) house and Jack Good was there. He was raving about the Ral Donner single and said that we should cover it. I suggested that Jack should sing it himself. I had heard Jack sing and he sang well. "The reason that I was with Jack and Marty was that they wanted to record me with a friend of ours called Trevor Peacock. It was a comedy record and I was to be the guy who squirted a soda syphon over Trevor when he sang a certain line. The single was to be a joint affair with Trevor and myself. "Jack then came out with the idea that we can kill two birds with one stone. He would sing the Ral Donner song and put it on the B-side of the record under my name. You can imagine how I felt, but I went with the idea and the end product was that single. The B-side became the A-side. "I never sang a note." Trevor Peacock, incidentally, was Jack Good's scriptwriter on 6.5 Special and he wrote several hits, including Joe Brown's That's What Love Will Do and Jess Conrad's Mystery Girl. The song on the flip side is Hot Hiss Of Steam "featuring Jackie Atom". The lead singer and writer is, in fact, Trevor Peacock. You Don't Know What You've Got is a very catchy number - catch it here...and take a bow, Jack Good. When I chatted to Jack about You Don't Know What You've Got in 2003, he revealed that he had appeared on an earlier record, in 1960. 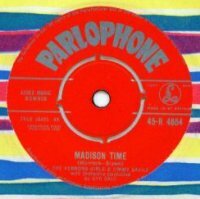 This was Parlophone R4654 Madison Time, on which the artists are listed as The Vernons Girls And Jimmy Savile. In fact, said Jack, he had performed as Jimmy. Jack much regretted that he did not have a copy of this record, so I made an appeal on this site's message board in June 2003. 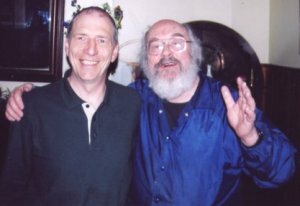 SInger Johnny Storme eventually located a copy in April 2004, so I was able to pass on the recording to Jack. And here it is - it was recorded while Jack was producing Wham!, hence the frequent references to the show in the lyrics. Jack trusted Marty Wilde's judgment of songs. When a record company brought him a disc called Schoolboy Crush by a new singer, he asked Marty for his opinion. Marty listened to it, turned it over, listened to the flip side and said: "That's the song for your show." Jack told the record company he was interested only in the B-side, so the company changed the publicity and flipped the record, which went to number 2. The song was Move It by a singer from Hertfordshire who had taken the stage name Cliff Richard. Jack Good wrote a weekly column in Disc magazine in the early 1960s. This is a typical piece of Good pop philosophy, from 1960. The current number one recording in the States is a disc that would never have got past the selection committee in any British recording company. Of that I am sure. Not that it could possibly have been made over here. No self-respecting British recording engineer would have made a record like this. He would rather resign his job. Nor would any British A and R man conceive a record in terms of the one that tops the American charts. It just breaks all the technical rules, and runs counter to every idea of progress in recording techniques. This record is fuzzy, muzzy and distorted. According to present day technical standards it is appalling. If this record is good, then for the last ten or so years the pop industry has been wearing blinkers. However, for my money, the disc is not just good, it's sensational and revolutionary. It is now released by Top Rank and is called "Quarter To Three," by Ulysses Samuel Bonds. A few weeks back, I commented on the difficulty for a first-time winner to achieve a hit follow-up, and I quoted U. S. Bonds as an example of one of the artists who bit the dust on his second attempt. "New Orleans" was a knock-out, but what a disappointment when "But Not Me" followed. It didn't mean a light. Bonds was marked down as a flash in the pan. "Quarter To Three" changes all that. The pan is sizzling up to flash-point again. This disc is so exciting that for your health's sake, you should restrict the number of plays you give it to three times a day -- and never during or after meals! But it is not the record itself that is the most important thing. It is the light it throws on the limitations of the current approach to the business of making pop records. For some years now, the technical side of recording has been concerned exclusively with realism. The tremendous progress in recording techniques and equipment has made this trend inevitable. Records have been made of ping-pong matches, railway trains and even road drills. And they sold in thousands. People who would write fierce letters to the council to complain about road drills in the street outside their homes, flooded to pay two pounds for the privilege of hearing them reproduced to the last thud and splutter in their front rooms. Exactly the same thing happened when painters discovered perspective. They became so engrossed in the fun of cheating the eye into believing it was not looking at a painting, but through a window, that they forgot all about making pictures. After realism -- exact reproduction of nature -- follows surrealism, where the techniques of realism are transferred to a world of fantasy. The eye of the old man in the painting is still painted with eye-cheating accuracy. But it just happens to be painted in the middle of his forehead. Surrealism came to recording with Rock'n'Roll. Echo-machines, limiters, equalisers, tape delay, were all employed to transform the sounds being made in the studio into noises that were even more real, more compelling. more immediate and exciting than reality itself. Echo-chambers gave small voices the sound of rich reverberating ones. A tap on a drum was converted by the engineer's magic, to the sound of a ten-foot giant hitting a six-foot tom-tom. A new sound-world of fantasy was built up. But the style was only realism, carried to a higher plane of imagination. Now Ulysses Samuel Bonds introduces a new era of pop-recording. Realism and Surrealism is old hat. Impressionism is the thing. "Quarter To Three" is clearly not interested in reproducing the sounds of a band and a voice, of a group chanting and clapping in the background. These things are only useful as a canvas upon which an impression can be painted of the changing textures of sound itself . . . the thickness of it, the muffled reverberations, the vibrant roughness of it. This is a whole new sound world. Not perhaps the sound of music, but the sound of sound. And the possibilities for development are endless and fascinating. And after that? Abstract and Formalist recording must inevitably follow. And then ? Action Recording, of course. The programme read like a sick parade. I did not enjoy the prospect of seeing the show . I was wrong. They were superb. Eddie Cochran was amazing. Far from showing signs of strain, he seemed even more dynamic than I have ever seen him. And how he used those blood-shot eyes. For the first twelve bars of his act he crouched with his back to the audience, while the Wildcats - greatly improved - whipped up a storm. Then on the first words of "What�d I Say", Eddie swung round to face his audience and there was a gasp. He was wearing light tan leather trousers, a turquoise shirt and a shining silver waistcoat. But the gasp was because he was wearing dark glasses! And it looked fabulous and outrageous. And what a great play he made out of taking them off after his opening song. This beat everything for turning a disadvantage into an advantage. Making the greatest use of his rocks-and-gravel voice, Cochran is the toughest, ruggedest exponent of rock. How he makes the music swing. He punches it over like a singing Rocky Marciano, and the whole audience was knocked out. Then at last came Gene Vincent. Pain-wracked as he was, both from his chest, and his leg, for the umteenth time in plaster through hisIt is often assumed that the race of dedicated troupers in the theatre is a dying one, and that the new generation of rock �n� roll singers have no respect for the traditions of the stage. Nobody who knows the backstage story of the Vincent/Cochran package show could accept this. I have never known such a loyalty to the maxim that "the show must go on". I arrived in Manchester on Saturday afternoon and visited Gene and Eddie, hearing they were unwell. I found them both in bed. Gene had not recovered from an attack of pneumonia followed by pleurisy. Eddie was suffering from insomnia, and terribly strained eyes. Looking at them, I found it hard to believe that they would be able to do their two shows th iron brace breaking, Gene drove himself and his audience unmercifully. Dressed in black from top to toe, Gene is like a demon possessed by the beat. His face pours with sweat, his face is contorted to an agonised smile, his huge eyes staring at a vision only he can see. Vincent is the most extraordinary eccentric and terrifying spectacle on the stage today. The volume of the screams, together with that of the band, drowned Gene�s voice, which is - the final contradiction, in this mass of contradictions - a soft, fluid and beautiful instrument. But it didn�t matter. To watch him was enough...and knowing how ill he was, for me it was too much. I have consulted many sources in writing this feature. The main ones were:6.5 Special magazine (Daily Mirror publication,1959), (2) History Of Rock partwork, interviews for Halfway To Paradise by Spencer Leigh and John Firminger, (3) Hit Parade Heroes by Dave McAleer, (4) correspondence from Paul Pierrot.. Where I have used a quote from one of these sources, it is acknowledged in the main text by use of the number in parentheses.